Who is the Diabetes Hero Squad? 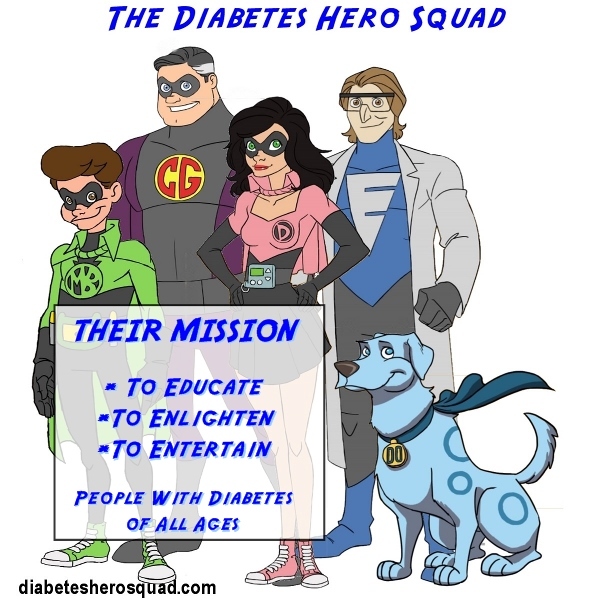 A group of animated diabetes heroes whose mission it is to "Educate, Enlighten, and Entertain people with diabetes of all ages" and that's exactly what they do. What Smokey the Bear does for fire awareness, the Diabetes Hero Squad is doing for Diabetes awareness. What else will be able to see the animated Diabetes Duo in? Many projects are in the works. From a full length DVD to their own animated series. Since they are digital and live in a digital age, the possibilities are limitless. The longer DVD is in pre-production right now and the script is already written. We hope to start shooting soon. Why was the Diabetes Hero Squad created? When someone is first diagnosed with diabetes they are usually confused and overwhelmed with the news. These characters will provide important information to people with diabetes in a clear and fun way. It will show them that everyone with diabetes can control it instead of it controlling them. But unlike the many usual dry and technical filmed presentations that are nothing more than a lecture, these characters will present important diabetes information in an entertaining manner. They appeal to people with diabetes of all ages, both Type 1 and Type 2 diabetes. The Diabetes Hero Squad will show that when it comes to having diabetes, you really can become your own personal diabetes hero.